With nearly 60 books notched on his pencil, many appearing on the New York Times bestseller list, it's safe to say, author Michael Jan Friedman knows his way around the alphabet. Add to the list some television and radio work and you've got yourself a pretty fine box of candy. Call it good and wake me in the morning. 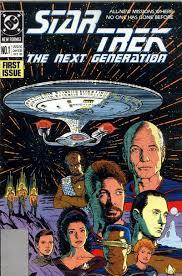 But, for this reader, being handed the heavy baton to carry forward new Star Trek ideas as the writer for the Star Trek: The Next Generation comic book series is the feather. If there is anything more cool-breeze than being linked to the iconic Star Trek franchise...in a medium that is cool unto itself...the list is short. Like many fantasy and sci-fi ideas, Michael dreams them in aurora and remembers them in words. As Pete Townshend once said, "Nothing is everything." 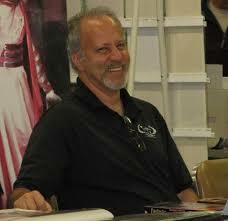 Casey Chambers: Michael, you were the writer for the popular "Star Trek: The Next Generation" comic book series. (1989-1996) How did you land that gig? 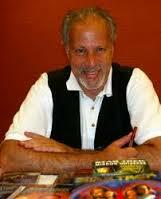 Michael Jan Friedman: Well, I had first started writing novels for the Pocket Books Star Trek program. I guess I had maybe written three of them and was invited to their Christmas Party...which was basically a couple of pizza pies and sitting around a conference room. 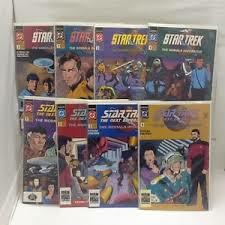 (laughs) And I met a guy named Bob Greenberger who was the Star Trek editor at DC Comics. And we kind of hit it off. At the time, DC was only publishing an original series comic. But Bob said pretty soon the license was going to be renewed and was going to include the new show..."The Next Gen." And he said at that time, we'll talk. When DC got "The Next Generation" license, Bob offered me the gig. It ran 80 issues. And I did like...77 or 78 of them. To tell you the truth, I really thought of it as my property. (laughs) I was always a little annoyed whenever Bob said, 'Yeah, we're gonna give someone else a month here and there.' But it was a great opportunity. I loved doing it. It was a lot of fun. It was like writing a second "Star Trek" TV show. Casey Chambers: Yeah, they read like episodes, too. When you're writing a monthly comic like that, how do you determine how many issues a story is going to be? Michael Jan Friedman: Well, it's kind of an instinctive thing. There's no science to it. I'm sure there were stories that I wrote in three issues that I could have written in two or even one if my life depended on it. But they just felt like two issues or three issues or four. I think four issues was the longest arc I did. But, ya know...you write the outline for the story and kind of break it down and see where the high points are and take it from there. It's not a science. It's more of an art. Casey Chambers: What was the hardest part about working on this comic? But a large percentage of the time, I would come up with something thinking, 'well they're never going to do this.' And of course, I'd get a response back from Paramount saying, 'We can't tell you why we're not approving this storyline...but we're not.' Of course, I understood whenever they said that...it meant that they had the same story development. Which is very common. If you're proceeding from the same premises, it's hardly unusual for writers to come up with the same story possibilities. So, that was the hardest part about working on that comic. The easiest part was working with the artists. The letterers and the colorers. It was always a great feeling to write a script and then see it rendered. I think every comic writer has a little bit of an artist in them. And to see how the artist interpreted the script and rendered it was always really exciting. Casey Chambers: It sounds like Paramount approval could be a big matzah ball. So when the first issues hit the stands...what happened? Michael Jan Friedman: Well, one thing I learned really quickly was that Paramount didn't want me to include any original characters. They wanted it very much about the television cast. Which was not at all the case with the DC comic Peter David and others worked on before "The Next Generation" comic came out. So I was, at first, proceeding from the idea I had to put in secondary characters who could then die or leave or get pregnant. But that wasn't the case. They (Paramount) wanted it to be very much about the TV characters. So I learned that very quickly. In terms of the response to it, it was wonderful. I mean, the sales were great. Fans loved it. I got lots of great comments. So, it was a wonderful start. When you're writing a comic as opposed to writing a book, you want to be visual. You want to think in terms of...what in this story are they going to put on the cover that's gonna help sell this book? What are we gonna show in the inside in each panel? Where am I gonna get the action from? 'Cause there has to be action. 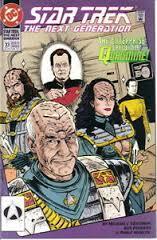 Even in a cerebral story, which "Star Trek" tends to be, you need more than just talking heads. You need action. And where is that gonna come from? So Klingons running wild on the Enterprise was a great visual idea. I knew the artists would salivate when they read that script. Casey Chambers: I know it's been 20 years since the series wrapped...but do you remember having a favorite story? Michael Jan Friedman: My favorite one...probably "The Worst Of Both Worlds" which were issues #47-50. It's when the crew posits in an alternate timeline...where the Borg have been successful in taking over the Federation. Looking back, I would say that was my favorite arc. Casey Chambers: Thanks for sharing that. Now you had mentioned Peter David earlier. The two of you collaborated on a great mini-series called "The Modala Imperative." Michael Jan Friedman: Yeah, Peter and I are good friends and we've actually collaborated on a number of projects. And very often with Bob Greenberger. It has always been very comfortable collaborating with those guys. Writing is such a solitary life. It's not as efficient to work with other people, but it is more pleasant. And it's necessary, in a lot of cases (laughs) to get you out from behind your desk and talking. In the case of "Modala...", Bob engineered that. They gave us an opportunity to mix the generations. To an extent. Not to a great extent, but to an extent. He knew that would be a big sales boost, so he went for it and got Peter and me to write the two 4-issue parts for it. Peter had been writing the original series at that point and I was on "Next Gen." But for "The Modala Imperative"...we switched. He actually got the better assignment, because he was able to bring...who was it...Spock and McCoy, I believe...into the "Next Generation." McCoy had already been established. Spock was going to be eventually. It was a great series to work on. The art was terrific. Adam Hughes did the covers. It was great. Casey Chambers: Can you remember buying your first comic? 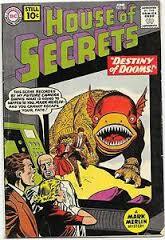 Michael Jan Friedman: It was a "House of Secrets" comic from around 1961. I don't know that I spent my own money on that comic, but I do know I picked it off the newsstand. I believe I went to the store with my father. My parents, unlike some parents, remembered fondly their days of reading comics and they actually encouraged me to read them because they knew...reading comics was reading. I've since found it on the internet. And it's interesting. The cover didn't look exactly the way I remembered it, but all the elements were there. And it was great. It was science-fiction and I love science-fiction. Shortly after that, I bought some DC comics. And then, when Marvel came out, I bought "Fantastic Four" (#1). 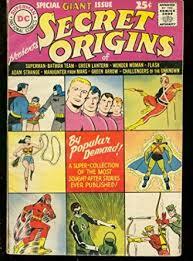 And I had the infinitely hideous financial sense to trade it for "Secret Origins" (#1)...which I liked a lot better! But in any case, you can tell I was starting to read comic books in the very early '60s. Casey Chambers: It was a great era for comics. Michael Jan Friedman: Yeah, Marvel was just starting. And with my little kid sensibilities, I liked DC a lot better. It was clean. It was brighter. It wasn't as gritty. Ya know, Marvel seemed to me to be...I don't know...kind of too real. Too gritty. Too violent, maybe? It took a couple years for me to really understand Marvel and embrace it. 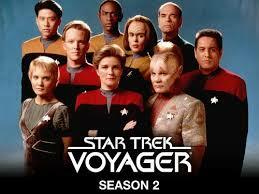 Casey Chambers: Switching gears, in '95 you also wrote an episode of the "Star Trek: Voyager" TV series. ("Resistance" - S:2/E:12) Tell us about that. Michael Jan Friedman: Well, Kevin Ryan was my script writing partner. We had pitched to "The Next Gen..." a few times. And "Deep Space Nine"...we had pitched to Ron Moore one time. So we were in pitching mode. And almost invariably, we would give them six pitches and four or five of them would already be in development. It showed that we were thinking along the right lines. But they were listening to a thousand pitches a year, so it wasn't surprising. You had to be very, very lucky. And the pitch we hit paydirt with was...(Captain) Janeway plays a Dolsanaya to a Kazon...Don Quixote. So all these "high content" pitches, which are the best kind you can come up with, are from somewhere. And this one was from "Don Quixote." And that's the one they bought. When they went into production, of course, they made some changes to it. They actually changed the Kazon to a sort of a "race of the week" kind of thing. A Nazi-esque ruled planet with the Don Quixote character being a former revolutionary. And he thinks Janeway is his daughter. So, he's a deluded but noble person just as Don Quixote was. Janeway is very much grounded in reality and rejects his delusions just as Dolsanaya did. Eventually, she sees his nobility and willingness to sacrifice himself and in the end embraces his illusion. Casey Chambers: Luck and timing, no doubt. Michael Jan Friedman: Yeah. You have to be not only good and on point, but very, very lucky. Casey Chambers: That's a great story. Do you remember watching it for the first time? Michael Jan Friedman: I do. I do. I was sitting in my den with a bunch of friends and neighbors and it was very cool. (laughs) It was very cool. Although I'll tell you what...as cool as that was, I don't think it was as cool as when I sold my first book. Because the jump from being a print writer to a TV writer was substantial. It was huge. But not as big as the jump from being no writer at all to being a guy who is publishing a novel. In my professional career, that was the most euphoric moment for me. 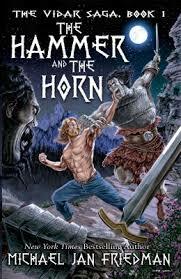 That was back in the mid-'80s when I sold my first book which was a fantasy novel called, "The Hammer And The Horn." There's a story behind that too if you want to hear it. Michael Jan Friedman: I was writing a humor column when I went to the University Of Pennsylvania and one of my friends there...his family had a literary agency in New York. So, when I wrote, "The Hammer And The Horn", I brought it to him. He took a few days to read it and said, 'Mike, this could be the next great science-fiction classic. Or, this could be a pile of horseshit. I don't know. I don't read this stuff. You need somebody who reads science-fiction and fantasy.' And he turned me on to another literary agency. But then I thought to ask them a question which I'm very happy these days that I asked. 'Where would you recommend I take this?' And they sent me to an agency that eventually did end up representing me. The woman there, Karen Hoss, was very good and saw exactly what I had to do to whip my manuscript into shape. She took it to Warner who was launching a new science-fiction and fantasy imprint named Quaestar. And the editor, Kathy Malley, bought the book almost instantly. And the next thing I knew, I was a published writer. Casey Chambers: Since The College Crowd Digs Me is primarily a music site, I'd like to ask about the kind of music you enjoy and what readers should check out or revisit. Michael Jan Friedman: Well, ya know, I'm a folk and folk rock kind of aficionado. And it's probably not very cutting edge, but I love Peter Paul and Mary and their predecessors. Bob Dylan. Simon and Garfunkel. One thing that recently caught my attention is a cover of "The Sound Of Silence" by Disturbed. Casey Chambers: Yeah, it's a surprising take. Michael Jan Friedman: Yeah, you wouldn't expect them to cover "The Sound Of Silence" and it's unbelievable. It's haunting. And the video is tremendous. They really put a different spin to it. I don't know about the album, but I would recommend that song. And I think everybody should listen to some folk and some folk-rock regardless of what else they like. And I actually had the occasion to meet Art Garfunkel. Guess it was a year and a half ago. He was recovering from larynx surgery, I think it was, and trying to get his chops back. Well, Pete Fornatale...he was a very popular DJ around here on Long Island...was turning 70. And since Simon & Garfunkel were turning 70, he stationed an event at our library. It was a Simon & Garfunkel retrospective. There was a power point presentation. And it was tremendous. And he said, 'Since you've been such a great audience, I have somebody who wants to come out and say hello.' And he surprised us by introducing...Art Garfunkel. Casey Chambers: That would've been great! Michael Jan Friedman: Yeah, and he sang a few songs. And he wasn't perfect because he was recovering from the surgery. But he was Art Garfunkel. I mean, when he was on...it was just magic. It was one of the high points of my life. Michael Jan Friedman: Just sitting in the car listening to the radio. So yep, that's my taste in music. Casey Chambers: Michael, thank you very much for taking time out to share a few stories today. I really appreciate it. Michael Jan Friedman: It's my pleasure. It was great talking to you. As familiar as a Cracker Barrel rocking chair. As satisfying as an extra-long back scratcher. 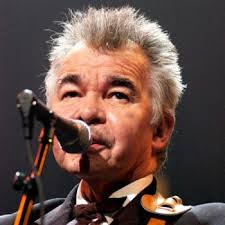 That would be John Prine. And for nearly 50 years, John has been trying to connect the dot-to-dots of life in song. And he reminds us, with a gentle hand, that feelings are never cheap. Lives are never simple. And a smile goes a long, long way. He's as rare as honesty. An American treasure, for sure. He's the "Ferris Bueller" of singer-songwriters. And though John would be the last one to admit it...he's a righteous dude. This list could easily be filled with another ten songs. And another. And yet, another still. at the wrong end of a broom." pressed between the Holy alphabet." And the beauty within lies unfurled." "You come home late and you come home early. You come on big when you're feeling small. You come home straight and you come home curly. Sometimes you don't come home at all." looks just like a diamond ring?" at least around here they do. "Your daddy never, meant to hurt you ever. He just don't live here, but you've got his eyes." "Ahh baby, we gotta go now." take me back to sunny country side." that's as big as a house." I suggest you go out and buy all the John Prine records you can find.